The drivebelt is a part of the engine that can cause some confusion. I hope this article can shed some light on the matter for most people. What causes that confusion? A engine can have multiple belts, but there is a difference between the drivebelt and the timingbelt. For more information on the timingbelt, I'd like to direct you to the page that discusses that topic. The biggest difference is that the toothed timingbelt, that drives the camshaft pulleys, isn't visible on most engines and it tucked away behind a few plastic covers. The drivebelt(s) are visible and have ribs along the length of the belt. The drivebelt is a reinforced rubber belt, smooth on one side and with multiple ribs along the length of the belt on the other side. The smooth side often has the manufacturers name on it and the code that identifies the sort of belt. Example of a drive belt with 6 ribs. The belt pictured above, for example, has the code 6PK1018 printed on it. 6PK means that the belt has 6 ribs. If the belt would have had 8 ribs, it would have been 8PK, etc. The number after that gives the length of the belt in mm's. 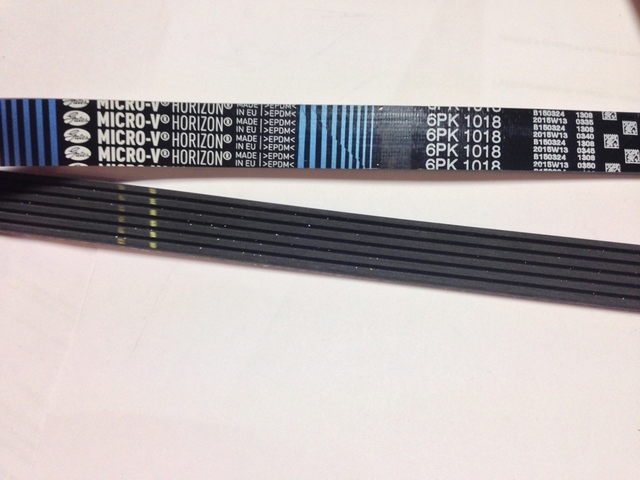 This belt is 1018mm's long if you were to cut it and lay it out end to end. The name actually already tells you what it does. The drivebelt is used to drive the various auxiliary parts of the engine or car. This could be the alternator, the water pump, the power steering pump, the air-conditioning compressor or even something like a supercharger. These all take power and are driven by the crankshaft. Most belt have a tensioner that pushes on the belt with a certain force to keep them tensioned. Guide rollers can be used to direct the belt along a drive pulley or guide the belt away from other engine parts. They can also prevent the belt from fluttering which would cause unwanted noise, vibrations and could cause the belt to slip. The ribs on the inside of the belt are not there to guide the belt along the pulleys as some people might believe, but are there to increase the friction surface of the belt. The wider and more ribs on the belt, the higher the load it can withstand without slipping or breaking. The picture above gives a nice example of how complicated the drivebelts can be arranged on a engineblock. 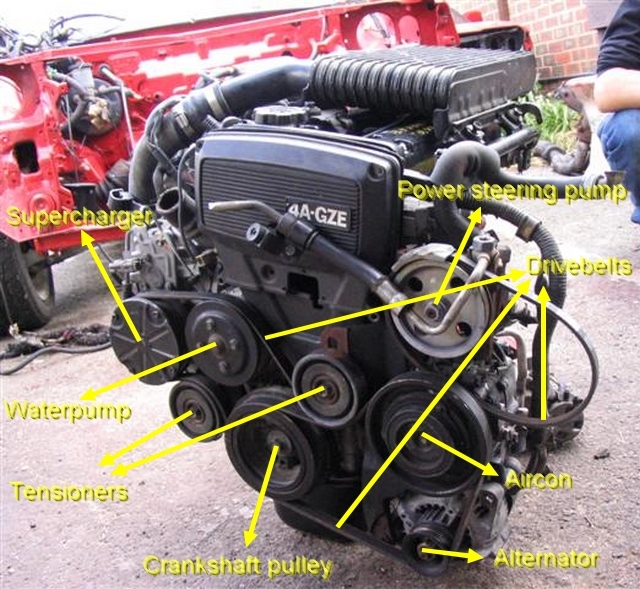 The 4A-GZE engine in the picture above has numerous auxiliary parts that need to be driven by the drivebelt. The engine above uses no less than 3 belts to drive all of them! The drivebelts themselves have a pretty long life, but they must be changed out every once in a while to prevent them from failing when the car is driving. Being a rubber product, they can dry out and start showing small tears. Or they can simply be torn or damaged when bit by something while driving. When the drivebelt fails, the parts that it drive no longer function and in case of the waterpump, alternator and power steering pump, that could have some nasty side effects. The pictures below are drivebelts I have replaced on some of my cars myself. They are nice examples of when you really need to change out the drivebelt. 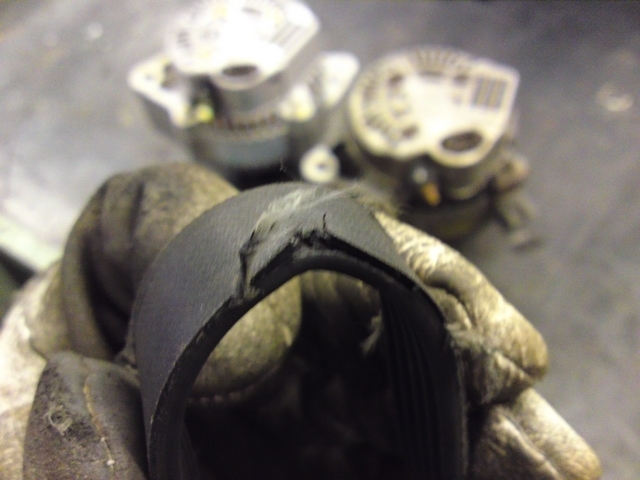 A damaged and a dryed out drivebelt. Look for these signs and you know that you need to change the drivebelt on your car. But when you replace the belts, you also need to tension them again. Some cars have hydraulic tensioners that always keep the right tension on the belt. Other belts need to be tensions by hand. Sometimes it's a matter of sliding a alternator along a bracket and bolting it down when there's enough tension on the belt. Other times you need to rotate a spindle for a tensioner pulley to set the right tension. The belts need to be at a certain tension to prevent them from slipping when there is not enough tension on them. But on the other hand, to much tension isn't good either as it can stretch and dame the belt itself or put to much strain on the auxiliary parts and damage their bearings or pulleys. What the right tension is, depends on the belt, routing and application and can thus vary between engines. There is no set value that applies to all drivebelts, so you need to check what tension you need when replacing a drivebelt. Most manufacturers will have the right tension for the drivebelt listed somewhere and the correct way to check for the right tension.